It’s late here on the East Coast, but it’s E3 so I’m not bothered! Bethesda Softworks of beautiful Maryland, USA (!) 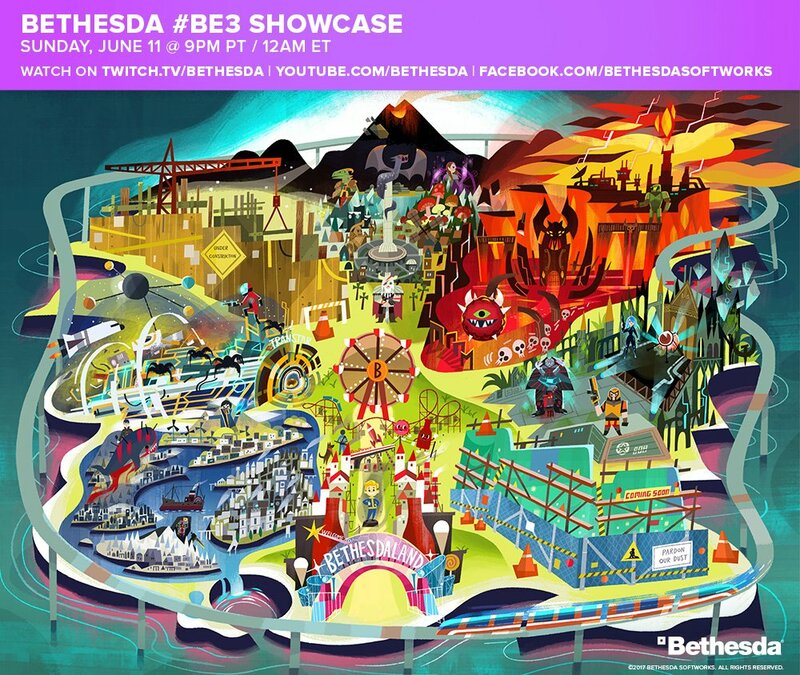 opened its Bethesdaland attraction earlier, and has concluded the last major event of E3’s opening weekend. It’s one of the most important private publishers in the industry with some of the coolest franchises, so similar to my previous posts, here’s a round-up of what it covered along with some thoughts and trailers. Virtual Reality: Bethesda showed two upcoming VR games: DOOM VFR, no release window announced, and..
.. and Fallout 4 VR. This one is October 2017. Elder Scrolls Online Morrowind: Bethesda is pushing this recent release in the ESO franchise. Creation Club: Announced a community service to provide more content for Fallout 4 and Elder Scrolls Online. Coming this summer on Xbox One, PS4 & PC. Bethesda is known for having great community offerings and fan service, including encouraging gamers to modify its games. Elder Scrolls Legends – Heroes of Skyrim: Competitive free-to-play card game is coming to mobile. New content as well. June 29th. Elder Scrolls V: Skyrim for Switch: As I mentioned in my earlier writing, totally expected this to be at the conference and here it is. I didn’t catch a release date though, I believe it’s still set for Fall 2017? Dishonored: Death of the Outsider: This is a brand new standalone story in Arkane Studios’ Dishonored universe. Out on September 15th. Quake Champions: The PC-only online shooter Quake Champions will have new maps and a competition. eSports! The Evil Within 2: On Friday, October 13th, psychological horror game The Evil Within 2 will release. Its trailer is intense. Fair warning! Wolfenstein II: The New Colossus: Lastly, Bethesda ended the show with its best reveal, in my opinion. In the true follow-up to 2014’s Wolfenstein: The New Order, this year’s The New Colossus is set in America during an alternate-history Nazis seem in control of the government and police force. Our hero, BJ Blazkowicz, is now an expecting father that doesn’t want to raise his twins in a society that’s ruled by crazy Nazis. So of course, he sets out to take down the entire regime. Releases October 27th! What It Didn’t Show (Yet): Prey content, it just came out so that makes sense. Nothing on the alleged space game Starfield, likely because Bethesda only showed titles that will be released this year. Goodnight for now, more to come during a busy week ahead!